The DICKEY-john ASM II Seed Control Monitor constantly checks the regular grounding of the seeds and the proper functioning of your seed drill online. Thanks to the photocells mounted on each row of the seeder, the system immediately warns the operator of any anomaly such as the interruption of the descent of the seeds or the obstruction of a falcon. A sound alarm and a warning light on the console indicate the row where there is a problem, the Monitor DICKEY-john ASM II provides the precision necessary to optimize the sowing and ensure a homogeneous growth of your cereals. When it is switched on, the DICKEY-john ASM II seeding monitor is ready to work. Rely on him to minimize losses and optimize the quality of your sowing. Every anomaly during the seeding is signaled with an audible and luminous alarm that indicates on the display the number of the defective row. 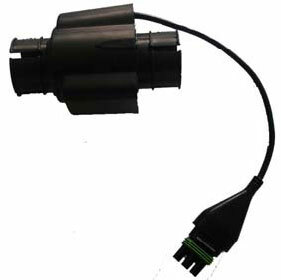 It is possible to adjust the light intensity of the diodes and manually interrupt the alarms. The DICKEY-john ASM II Seed Control Monitor is very simple to mount on any planter. DICKEY-john offers solutions suitable for most sowing machines. 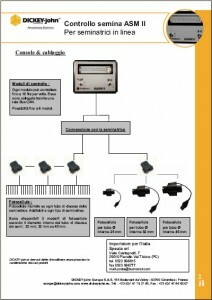 A system consists of a console, a wiring harness, photocells suitable for your planter and one or more photocells connection modules to the system. To prevent any slowing of the flow of seeds on the rows of the seeder, the operator can adjust the alarm activation threshold at any time. The thresholds can be adjusted specifically for each type of seeds (rapeseed, wheat, peas, etc. ...). 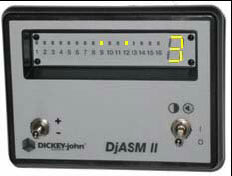 The DICKEY-john ASM II Seed Control Monitor has the ability to control up to 128 files. From rapeseed to wheat, through beans, are all types of seeds that can be detected by the new DICKEY-john photocells. When you purchase a Seed control monitor , you benefit first of all from the spread of DICKEY-john products. The advanced DICKEY-john technology is designed by technicians specialized in mechanics, electronics and computer science. We build our products, guaranteeing total quality. Our production is ISO 9001 certified .